Richard Strauss (Michael Pennington), the musical giant who forms the bridge between romanticism and modernism, is desperately looking for a new librettist to inspire him and turns to wunderkind writer Stefan Zweig (David Horovitch) an Austrian who in the 1930s was the most widely-read and translated writer in the German language. Zweig is Jewish and the Nazis are in power but in Act 1 of Collaboration, these facts remain ominously in the background. Strauss denies any other than artistic challenges – “I must find a subject or die”, he tells Zweig. He has written music under many regimes, he explains, and “music is indifferent to regimes”. But the regime is not at all indifferent to music and when Strauss is appointed the country’s musical “head of state”, it is as much about bringing him and other German musicians into line as it is about honouring him. Strauss more or less shared some of the casual anti-Jewish prejudices and stereotypes common in the middle class, and not only in Germany. But he worked closely with Jewish musicians and librettists – how could he not, since Jews were at the very heart of German music and culture. With its quiet simplicity, Philip Franks’ production leaves plenty of time and space for audience members themselves to consider the profoundly difficult problems the play addresses. The action takes place in two polite bourgeois drawing rooms. The artist works both in secret and not in secret and is rarely aware that his or her actions may in future be dissected in public. The question “what would you have done?” reverberates through discussions at the interval. 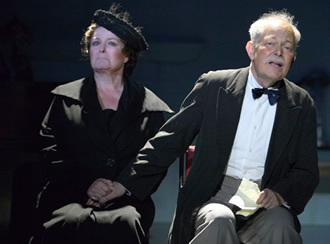 In the second act we find out with shocking drama what poor Strauss was forced to do, as he signs a truce with the regime to protect his Jewish daughter-in-law and grandchildren. The growing ruthlessness of the system is brought home in the character of Hans Hinkel, leader of the Nazi’s cultural purge as head of the Kampfbund für Deutsche Kultur (Fighting Society for German culture). It is an astonishing fact that Hinkel was never held responsible for his crimes and lived quietly until 1960 in Göttingen. Brilliantly portrayed by Martin Hutson, in Act 1 Hinkel is all flattery, the threat no more than a throb in the background. But in Act 2, the mask is off, bringing home to Strauss that the screw is tightening to the point of violence. Hinkel’s flattery survives as nothing more than a cruel joke. Strauss realises that to save his family he must capitulate. Zweig may be unknown in Britain, but his work is still widely-known in translation into other languages, including Arabic. This secular Jew, who was part of the Viennese avant-garde, once said that his mother and father were Jewish only by accident of birth. He sees himself as a citizen of the world, and in the play he says that this citizenship is a gift conveyed on him and Strauss by their artistic gifts. In their different ways, Strauss and Zweig struggle to keep themselves alive as artists – their sole identity. But in the end, each must accept the identity forced on them from above. A lesson of history is that once a totalitarian regime has defeated its opponents as a class, the ability of any person to survive as an individual disappears. Zweig did not survive the destruction of German cultural life and committed suicide in exile in Brazil. When the opera the two created – based on a story by Ben Jonson – was first performed in Dresden, the theatre was happy to place the Englishman Jonson’s name on it, but not to credit Zweig. Strauss’s brave insistence on the reinstatement of his librettist’s name brought the whole weight of the regime down on him. He was forced into writing a grovelling letter to Hitler which at the end of the war resulted in his being brought before the de-Nazification committee. Collaboration is part of a double bill alongside Harwood’s play, Taking Sides. They run at the Duchess Theatre, Covent Garden until 22 August. Special offers are available for both shows.